I remember clearly when my love affair with rosé wine began. It was at a café called Le Fournil in the Provence village of Bonnieux, not far from Apt and Roussillon, where I ordered a carafe of cheap rosé to accompany grilled baby goat. Since then, I’ve discovered rosé wines are incredibly versatile and drink nicely with many different types of food—from grilled fowl or lamb and spicy Mexican cuisine to seafood and pasta dishes. I can’t think of another wine that so deftly covers the waterfront, food-wise. Rosé is, technically, a red wine, but one that drinks more like a white wine. It’s made from red grapes—often Grenache, Mourvedre or Cinsault. But during production, the grape skins—which give color and tannins to wine—are only left in contact with the grape juice for a matter of hours, as opposed to days or even weeks for most red wine. That limited skin contact results in the wine having a pinkish hue, but very little in the way of tannins, which makes rosé an easy-drinking wine and one that can be served chilled, like white wine. Perhaps because of its pink color, rosé is assumed by many people to be sweet. And it can be, especially in the bastardized incarnation know as White Zinfandel. But French-style rosé is typically very dry. 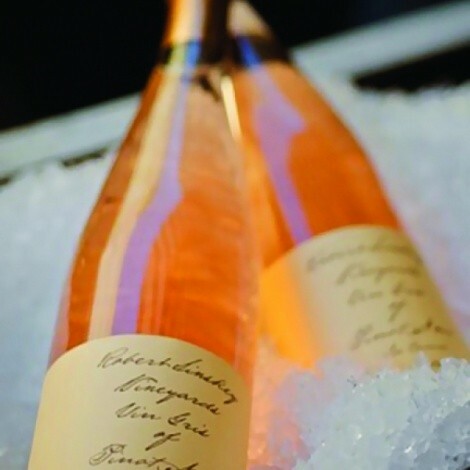 Since it’s usually drunk chilled, rosé is perfect for sipping on the deck during the summer months. But, it’s not a wine to ponder or to put away. Rosé is always best consumed within a year or two of its release. Vintages simply don’t matter. On my first visit to France, the biggest surprise I encountered was the amount of rosé that the French drink. From Paris to Provence, carafes, glasses and bottles of rosé are consumed in vast quantities. It’s the perfect bistro wine to sip at a sidewalk table. And I wish more restaurateurs in this country would push rosé as a grown-up substitute for the ever-popular White Zin. But alas, I know of only a handful of restaurants in Utah that even offer rosé—although the number, happily, is on the increase. One of my favorites is Ch%uFFFDteau d’Aquéria Tavel ($19.49) from France’s Rhone Valley. It’s a good baseline example of what French rosé should taste like. But there are American and other New World wine producers making high-quality rosé as well. Among the good ones are Bonny Doon Vin Gris de Cigare ($11.99), Sinsky Pinot Vin Gris of Pinot Noir ($24.98), Cline Mourvedre Rose ($10.99), Calera Vin Gris ($17), Fisher Unity Rose ($14.99) and the delightful, dry La Grenouille Rouganté, aka Frog’s Leap Pink ($13.99). Equally enjoyable is Belle Glos Pinot Noir Blanc ($16.99) from Sonoma county, with bright, fruity flavors and crisp acidity. But, more and more during these summer days, I find myself reaching for what I consider to be some of the best rosé values around: Spanish Rosado from Rioja winemakers like Marques de Caceres ($4.99) and the outstanding Bodegas Muga Rioja Rose ($14). True, rosé is a flimsy little summer cottage of a wine. But, that’s exactly what I’m looking to drink with burgers or prawns from the grill when it’s 90 degrees outside. The flexibility of rosé and its informal, slap-on-the-back friendliness make it a good choice for picnics or anytime that red wine just seems too heavy. But do yourself a favor: Stay away from the icky Paul Masson/Almaden/Carlo Rossi versions. Otherwise, go forth, chill and don’t be afraid to drink pink.